This post describes how to create a navigation drawer with account picker. Android navigation drawer is a new UI pattern introduced in the last I/O. The android navigation drawer is esentially a layer that appears from left to right in the left side of the screen. 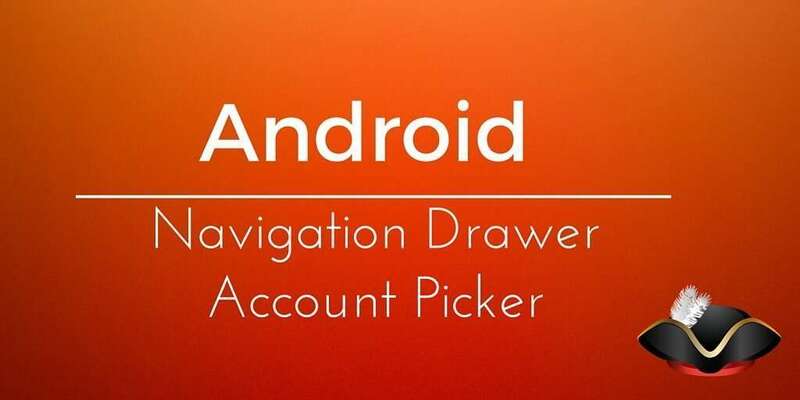 I want to explain here how to add an account picker to the android navigation drawer.To do it I will use the new Google Service API with Drive SDK mixing them in order to achieve this goal. If you look at Google Drive App you will notice that you can choose your account directly from the left drawer instead of picking it from the settings. In this post, I will show how we can get the folder in our Google drive account selecting it from the left navigation drawer. At line 7 we introduce a FrameLayout in order to handle the UI content dynamically. Instead of using the ListView directly after the FrameLayout (as in the official doc), we introduce a linear layout (line 12) to hold the spinner (line 25) and the menu items. The spinner will be populated with the active user accounts so that when user activate the navigation drawer he will find the account picker too. Once we have our account list, we have simply to define a new adapter so that the spinner can be populated. At line 8 we select the account chosen. Then we save the credential info chosen (line 9) by the user and start the async process to retrieve the user folder (line 12,13). The first step is already done when we select our account using the spinner (see above), so we have to focus on the second step (the authorization). The first thing we have to do is trying to access to the drive data so that we can know if we are already authorized or we need an authorization. The process to access to the remote drive data uses an HTTP connection so we can’t handle it in our main thread, so that we have to create an async process using AsyncTask. As we can see, we simply try to retrieve user folder (line 7-10) and we catch UserRecoverableAuthIOException (line 13) to get informed if we need to be authorized. If we have to be authorized then we start a new Activity (line 14) asking the authorization request to the user. At line 6 if we have a positive result (RESULT_OK) then we start again the async process to retrieve user folders. We simply populate the listview adapter with the folder names. I am not sure if you might know what the reason could be? It could be your account isn't authorized. There are some steps behind the code that must be completed in order to enable the account. Can you post the log? Btw, really enjoying the blog. Look forward to future posts. Thanks for the reply. No worries, got it resolved. I think it was a problem with my dependencies and Google Play Service. Btw, enjoying the blog, look forward to future posts. What could be the possible reasons..? ?